Andy, who is studying woodworking in Germany, alerted me to the fact that Dictum also sells the Roman-style nail sold by Objects of Use and Rivierre Nail Factory. These nails are sold under the brand “Sonstige” but appear identical to the others I’ve encountered. I’ll know shortly if that’s the case – I’ve ordered 1,200 from Dictum. They are very reasonably priced. If you go to the Dictum site you will see they sell two kinds of Roman nails in five sizes. Which do you need? That’s why you pay me my exorbitant salary. All of the steel nails that Dictum sells are headed nails, meaning they are designed for holding on cabinet backs or bottoms. Or they are used to hold casework together when nailed from the outside. These nails are meant to be visible. Don’t use them to attach mouldings. When you nail things together you have a top board and a bottom board (or outside board and inside board, if you please). The top board is the more important one for calculating the size of nail you need. Here is some quick translation work. The door nails are sold in two lengths: 30mm and 40mm. The 30mm nails are equivalent to our 3d nails and are used for fastening 3/8” thick (10mm) stock. The 40mm nails are equivalent to our 4d nails and are used to fasten 1/2”-thick (13mm) stock. 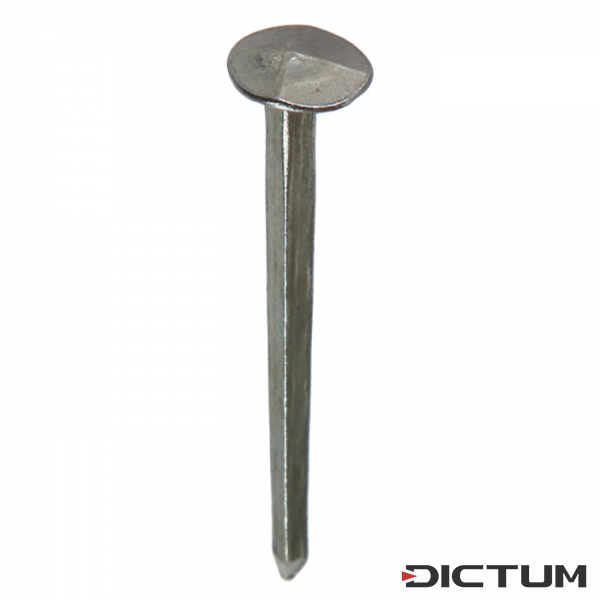 Dictum sells the plank nails in three lengths: 50mm, 60mm and 70mm. The 50mm nails are similar to our 6d nails are are used to fasten 3/4” (19mm) stock. The 60mm nails are like 7d nails and are used to fasten 7/8” (22mm) stock. The 70mm nails are like 9d nails and fasten 1-1/8” stock (29mm). Note that the sizes of wood above are approximate. Use your intelligence. If you are nailing pine, try going up one size of nail. If you are nailing oak, try one size down for starters. Roman-style nails such as these are best preceded by a tapered pilot hole. Use one of the tapered drill bits you use for wood screws and you’ll be in great shape. By the way, Dictum is a great company – I have taught there many times. So order with confidence. But I’d never noticed that they carried these nails. Get some. Get a lot. These are a good find. Sonstige in German means “other,” or “miscellaneous,” if my translation is correct. It most likely is the same exact nail as you found in the UK. I’m glad to be of assistance. Thankfully I finished the carpentry course in February, and one day when I don’t live locally to the company I’ll write about what happened. I think Brian is right. Also, I am pretty damn happy I just completed the nailing part of my rustic kitchen cabinet. Those nails are about to be Schwarzed. Already Scharzed, most out of stock. Huh, do you think these would be a good candidate for the dutch tool chest. This is a German boat chandler that carries a similar nail, except that the shaft is square along its length. The head is nice though, hand-forged looking. I used them on the six-board chest I blogged about a year or so ago. Mostly they are used as rivets for building clinker boats, but they work fine just as nails. You can click on the little English flag for English. I also use a fair amount of the copper nails/rivets too. They are available from many webshops.